So often in modern life we are bombarded by the hype of the local evening newscast or gauzy, slick advertising, only to be let down by the rather mundane reality of it all. Thus when I kept hearing that this spring flower season in the Sonoran Desert of southernmost California would likely be a “blockbuster” or a “superbloom,” I took it all in with the proverbial grain of sand. Drought conditions over the last five years starved many of us of the magic sight of vivid colors springing from dun-colored desert soils. Plus, you need just the right mix of several conditions for a strong bloom. Alas, the hype was right! Boy was it right. And the word got out not just in North America but around the world. Borrego Springs and the surrounding valley were inundated by massive crowds during parts of March and April, causing some local restaurants to run out of food on the first big weekend and overstraining toilet capacity. Traffic jams at times stretched for miles on access highways. This desert wanderer steered clear of the Borrego Valley as if it were some malaria-ridden swamp. Lucky for some of us, with just a little forethought, anyone wanting to see the spectacular flower displays could easily avoid crowds even on weekends. My plan for at least five separate day trips since early March was to focus on the southern and middle parts of Anza-Borrego Desert State Park or the adjacent BLM Wilderness Areas created by the 1994 California Desert Protection Act. And my plan worked. Even on a couple of weekend trips, I saw limited numbers of people and plenty of blooms. At the very start of March, I already encountered abundant phacelia, brown-eyed primrose. and rare desert lilies in the low elevations of the easternmost portions of the park off Highway 78 near Ocotillo Wells. I was shocked to see so many blooms so early in the season. Several times, I drove out Interstate 8 to the desert floor at the town of Ocotillo and drove north on Highway S-2 (Imperial Highway) in order to maximize the degree of elevation change I could experience in a single day of exploring. Early on, brittlebushes would be everywhere in the low hot desert, as were my top favorite: blooming indigo bushes. Just about everywhere I went this season I have seen brown-eyed primrose and pale blue phacelia. And at varying elevations, I encountered red chuparosa blossoms, rose mallow, white desert chicory, desert stars, bright pink sand verbena, golden desert poppies, Fremont pincushions, swarms of tiny eriophyllum in carpet displays (sunflower family), yellow desert dandelions, belly-level monkeyflowers, purple lupines and various blooming cacti. The climax of it all was a mid-April visit to McCain Valley at about 4,000 feet in the Carrizo Gorge BLM Wilderness area. Aside from the usual brittlebush and phacelia, I came across rare and precious blue larkspurs plus deep red penstemons. Sometimes the hype really is true. Another of the places to view wildflowers this spring was the Carrizo Plain National Monument, in a little known valley sixty miles inland from San Luis Obispo. In the last century, this was home to cattle ranches, winter wheat farms, and sheep herding. Today, this national monument is under the supervision of the Bureau of Land Management. On a recent visit, a friend and I approached the monument from the south, driving the Soda Lake Road through the long valley. After the incredible rains of this past winter, the wild grassland flowers have bloomed again with gusto, and people are coming to enjoy the area, which is otherwise rarely visited. We were thrilled to see vast fields of yellow daises, California gold, and forked fiddle neck. The large patches of purple phacelia and pink owls clover were even more spectacular, set off by the hues of yellow and gold. It was a landscape of color worthy of an impressionist painter. As we drove the long valley, the Temblor Mountains to the east were covered in yellow and purple as well. We turned up a road to the west toward the foothills of the Caliente Mountains and found large hillsides of California poppies with lupine and blue dicks. We returned to Soda Lake Road and continued north toward Soda Lake. The usual “mirage” of water was to our surprise actually water. A new experience! And what a gift to the animals, rodents, and birds that winter on the plain. At KCL campground, we had a few extra treats. We saw a great horned owl pair with two fuzzy white owlets, as well as Bullock’s orioles and Lawrence’s gold finches to add to the usual birds of the area. As we were leaving the monument, we spotted a burrowing owl perched on an old tumbleweed. The Carrizo Plain is a special place in all seasons. Its stark, hot, dry summer and fall contrast so with the wet cold winter, and then the spectacular brilliance of spring appears. The monument can be reached from Highway 58 on the north or from Highway 166 on the south. The visitor center is located fourteen miles south of Highway 58 on Soda Lake Road and is open December through May, Thursday through Sunday. From a visitor’s perspective the problem with this year’s bloom was that it wasn’t last year’s bloom; this year’s winter rains were late. January and February as well as early March saw some shower activity, but the hills retained their barren look. That dramatically changed about mid-April. Tiny green seedlings could be seen popping up in many areas around the valley floor. Desert gold sunflowers and phacelias suddenly colored roadsides in vibrant yellow and purple. Many of the annuals appeared to be much below “normal” size. At Hells Gate two visitors could only marvel at a one-and-a-half inch tall desert five spot. The average size ranges from four to sixteen inches. That one flower, on a stalk as thin as a thread, was the size of a penny. The two tiny leaves could only be measured in millimeters. Yet it was there and blooming, putting all its energy into that one little flower. What an example of the incredible tenaciousness and adaptability of desert plants! Hester added another observation: “The greatest response to this winter’s rain has been from the perennials.” Recently Neal and I (author) noted the same phenomenon while traveling up Warm Spring Canyon on our way to Butte Valley. Perennials like brittlebush, indigo, hop sage, and creosote were going all out. The lovely scent of blooming sweetbush with its exuberant spray of small, yellow flowers accompanied us on our entire journey up-canyon. Going into Butte Valley we saw an explosion of annuals, including fields of white stemmed stickleaf, Fremont pincushion, and false woolly daisies punctuated by glowing orange mariposa lilies. The real story of this year’s flower cycle takes place at midlevel altitudes between 2,000 and 5,000 feet. 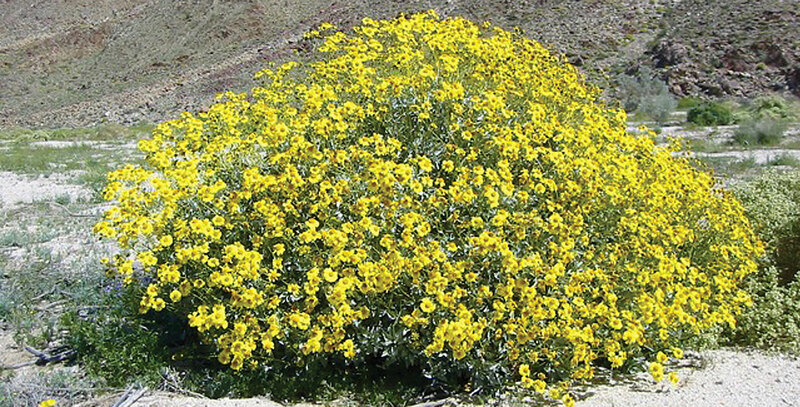 But to experience this bloom, one must not only get out of the car and put on walking shoes, but also get off the highways and into Death Valley’s backcountry, and take the time to see.